Students check if adults know multiplication table well! 8248 people were examined. 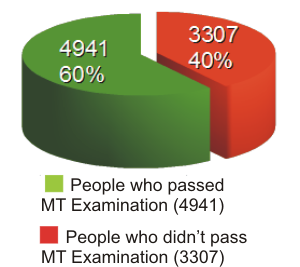 The title MT Expert received 4941 people. Although some people had the right to approach the exam every hour - examination pass ratio is relatively low 60%. This factor proves the need of organizing this type of action. 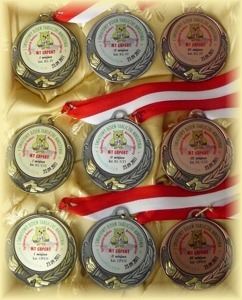 The competition was attended by 256 people: KL-IV (Class IV of primary school), KL-V,VI (class V-VI of primary school), OPEN (junior high school and older). Participants who were on the places from I to III received medals, diplomas and gifts: a set of mathematical cards 'Multiplication Table' and two books written by Andrzej Grabowski: 'Card games which help children to memorize the multiplication table' with dedication of the author. People who were on places from IV to X received diplomas.